Skull shape with wearing sunglasses shape designed, along with laugh when it get started. Volume buttons located on its teeth and power button on the glasses frame, easy and convenient to control. 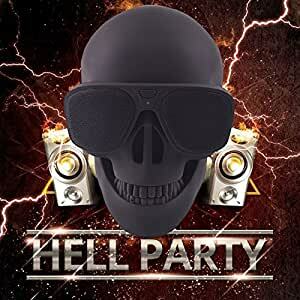 This skull bluetooth speakers can easily connect to laptop, tablet, kindle, iPhone, iPad, iPod and Android smart phones. Compatible with Smartphones from every generation that has Bluetooth. Built-in 1200mAh battery. About 10M(32.8 ft) transfer range for more convenient Use. Bluetooth speaker brings extraordinary stereo sound and crystal clear music experience. Also can be used in all different kinds of home and festival decorations, especially for Halloween celebrations. Hole design on the top of head for placing phone conveniently. Adoption of high quality material, the speaker is durable and long lasting use. Specially skull designed for easy and convenient use. The volume buttons locate on its teeth and power button on the glasses frame, easy and convenient to control. It can easily connect to laptop, tablet, kindle, iPhone, iPad, iPod and Android smart phones. What’s more, it brings extraordinary stereo sound and crystal clear music experience. Also can be used in all different kinds of home and festival decorations, especially for Halloween celebrations.